Léon Beyer makes super-dry wines that are almost undrinkable in its first 4-5 years. But the domaine has the good taste to wait to release the wines until the young wine has filled out and gained substance and character. The ugly duckling, sort of. 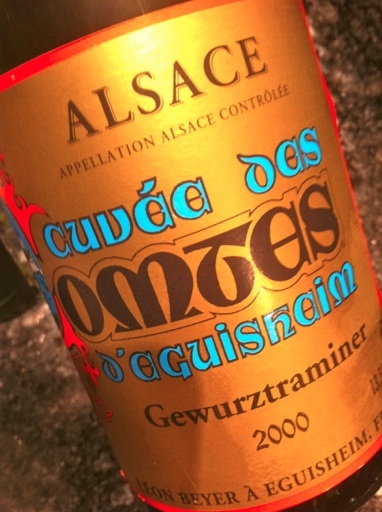 2000 Gewurztraminer Comte d'Eguisheim from Léon Beyer has grown on Grand Cru Eichberg and has a golden yellow color. The aroma is saturated with ginger, cloves, figs, quince marmalade, expensive vanilla and candied oranges. The taste is almost completely dry, but layers of fruit unfold as a peacock tail in the mouth, offering one sensation after the other. The finish is long, fresh and subtle with a nice minerality that lingers on forever. A magical wine, a privilege to drink it. Price: € 30.